From classical times and the exploits of the legendary Spartacus, men and women have fought for their freedom. The English Civil War, the French and American Revolutions, the abolition of slavery, the rise of socialist ideologies; all have been examples of the human desire to be free. In the 20th century, the great Marxist and Maoist experiments promised much but, sadly, inhibited freedoms rather than unleashing them. Nevertheless, the beacon of hope still shone brightly and after the tragedy and horror of World War II, the post-war world saw a rejuvenation of the fight for freedom. Today’s world is far from perfect, but it is a far better place for many people than it was. 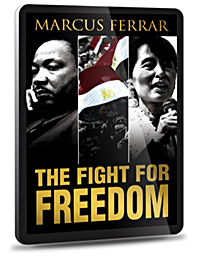 The Fight for Freedom is an inspiring story of the struggle to build a better world. This clearly written book of sixteen chapters tells the inspiring stories of the amazing characters and astounding events that played such a major part in this fight for freedom and waged against constant attempts to rein it in. It covers everything from the battle for civil rights and women’s rights to the more recent ‘Arab Spring’ and the revolution in the Ukraine. It is a must-read book for anybody wanting to understand one of the key drivers of human history.